HE’S HERE…AND FUNNIER THAN EVER! Alrighhhhttty then! It’s time to soar your winnings with Fly Casino’s newest slot game that’s just fun-fun to play! Ace Ventura is a 5-reel slot game that comes from the hilarious world of Jim Carrey, who played Ace in the 1994 mega hit movie. You’ll enjoy images of the most famous scenes from the film along with many hysterical sound clips. Play with a massive 243 ways to win whereby each spin gives you plenty of opportunities to win. 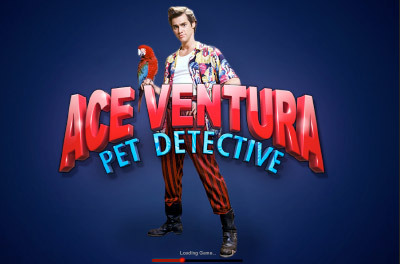 With a Free Games bonus symbol, plus a number of in-reel “pop up” bonus features, there is no doubt that Ace Ventura will keep you more than entertained win or lose! PLAY IT THIS WEEKEND AND ENJOY! 25% Unlimited Sunday! From 00:00GMT until 23:59 GMT, all members are invited to receive a 25% bonus up to 500.00 on your first deposit of $/£/€30 or more. Claim it ALLDAY as many times as you want! DOUBLE UP MONDAY! From 00:00GMT until 23:59 GMT, all members are invited to receive a $/£/€40.00 bonus on your first deposit of $/£/€40 or more. Claim it 3X! PLAY BIG TUESDAY! From 00:00GMT until 23:59 GMT, all members are invited to receive a 110% bonus up to 220.00 on your deposit of $/£/€ 50 or more.